What is there to say about this latest offering from Christ Riddell other than it is absolutely brilliant. Aimed at his younger readers it is the story of Ada Goth, daughter of Lord Goth, and her encounter with the ghost of a mouse; “call me Ishmael” he says. Just this phrase lets you know that you are in for some serious brain teasing. the book is full of allusions to other writers and stories in literary history and for the adult readers at least there is tremendous fun in seeing how many you can work out. For the younger intended readers it is a story full of adventure, weird creatures and lots of fun. The illustrations are superb, totally reflecting the characters and story line. They are full of exuberance and really add an extra dimension to the story. As for the production values; the book is a thing of beauty. 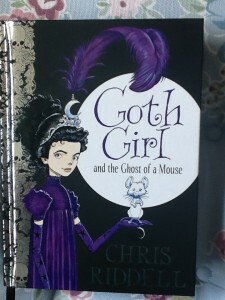 The purple metallic edging, the silver on the cover and endpapers, and the black ribbon bookmark are a throwback to the period that the book is set in. It is a book to treasure and a story to re-read and re-tell .